The Association is proud to support the development of bright, young scientists through the Milton Safenowitz Postdoctoral Fellowship. The Safenowitz family, through The Greater New York Chapter of The ALS Association, founded the award in memory of Mr. Safenowitz, who died of ALS in 1998. These awards are to encourage and facilitate promising young scientists to enter the ALS field. Fellows work with a senior mentor and receive extensive exposure to the ALS research community through meetings and presentations. After completing this fellowship, approximately 76 percent of the awardees stay in ALS research. They go on to establish their own laboratories to continue studying ALS and mentor more ALS researchers along the way. The rest of our Safenowitz fellowship program graduates go on to careers in the biomedical industry, nonprofits, and medical writing, with many still staying in the ALS space. Collaboration is highly encouraged between awarded fellows. 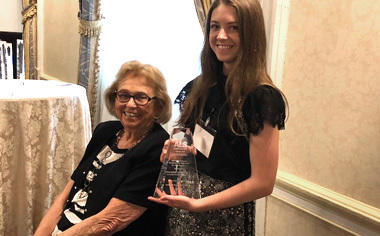 To foster this collaborative environment, The Greater New York Chapter of the ALS Association sponsors the Milton Safenowitz Postdoctoral Fellowship Symposium and awards ceremony in New York City. Bi-annually, the fellows gather to share research ideas through short presentations covering their research projects. The ALS Association makes a commitment of a maximum of $100,000 over a two-year period. All postdoctoral fellows in the ALS field are eligible to apply who have worked for 18 months or less as a fellow.